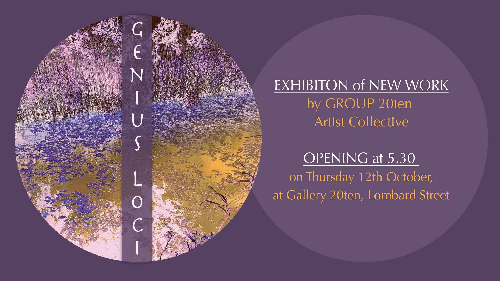 You and a guest are cordially invited to attend the official opening of Group 20ten’s 8th annual exhibition of new work. Inspired by the theme ‘Genius loci’ (spirit of a place) this exhibition of new work includes paintings, photography, prints and sculpture and is part of the Imagine Festival. Pat Carri, Darragh Lyons, Pat McArdle, Christine O’Brien, Conor Rush, Milia Tsaoussis-Maddock and Beata Zakrzewska. Gallery 20ten, Lombard St, is open from 1 to 5pm, Wed. to Sat. Email gallery@20tenartgroup.com or contact Christine 086 8197378. This entry was posted on October 10, 2017 by waterfordarts in Art, Exhibition, General and tagged 'Genius loci' (spirit of a place), Art Exhibition, Christine O'Brien, Conor Rush, Darragh Lyons, Gallery 20ten, Milia Tsaoussis-Maddock and Beata Zakrzewska, Pat Carri, Pat McArdle, whats on waterford.